During wartime the air aces of the combatant nations are often glamorized and depicted as �Heroes� and Italy was no exception. Adriano Visconti is often considered Italy�s leading ace of WWII, however, as with many aces today, the combat records of WWII pilots are now scrutinized. Adriano Visconti was born in Tripoli, Libya on November 11, 1915 the son of Galeazzo and Cecilia Dall�Aglio Visconti. On the 21 of October 1936, Visconti joined the Regia Aeronautica and trained at the Royal Academy in Caserta. After receiving his flying wings Adriano trained on the Breda BA 25 and later on the RO 41. In 1939 Visconti was assigned to the 50o Stormo, 159a Sq. ground attack unit stationed in Bengasi, Libya. At the outbreak of the war, Visconti flew combat missions using the BA 65 from June to the end of December 1940. During that period Visconti was decorated with 1 Bronze and 2 Silver Medals.� In January 1941, he joined the 54o Stormo CT, 7o Gruppo, 76a Sq. and trained on the Macchi MC. 200. From late 1941 to the Italian armistice September 8, 1943, Visconti flew the Macchi MC. 202. After the Armistice, Visconti volunteered to join the newly formed ANR. 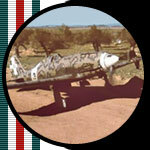 From that period until early 1944, Visconti flew as Captain in the ANR and commander of the 1a Sq., 1o Gruppo Caccia. In May of 1944, Visconti was promoted to Major. During the period in the ANR, Visconti flew the Macchi MC 205 as well as the Bf 109 G10. In every major conflict involving the armed forces of nations, records and statistics are routinely kept. The keeping of records in WWII followed the same practice as in WW1 which involved tabulating lists of air aces, the number of combat missions flown and the number of confirmed aerial victories as well as probables and aircraft damaged or destroyed on the ground. During the period of June 1943 to the Italian Armistice and afterwards, many of the records of the Regia Aeronautica were lost or destroyed.� This has sparked a debate about the individual combat records of some of Italy�s leading air aces, including Adriano Visconti. In some cases only the individual testimony of a surviving veteran is available while in other cases data is incomplete. It is therefore difficult to get a clear picture of the performance of the Regia Aeronautica aces. With this background we proceed to analyze the data available to us in order to asses the combat record of Adriano Visconti. As one can see, three different totals are available. The question which arises is the obvious discrepancy in the total number of combat missions flown and the number of confirmed kills. The next step in this analysis is to examine the methods of research in which the three lists were constructed. Massimello bases his figures from a surviving logbook while Biron  states the figures reported were personally given to him by Visconti. Clearly if 70 combat missions were flown then the figures Massimello provides must be incomplete since only half the combat missions given by Biron can be confirmed. 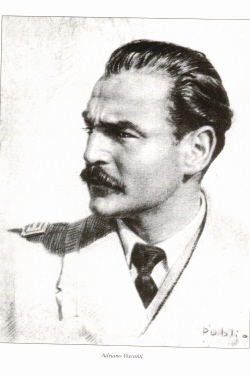 Many historians agree it is difficult, if not impossible to get exact figures for aerial combat victories of any pilot.� And until new data becomes available that reconciles the number of combat missions flown as well as the number of confirmed aerial victories, Adriano Visconti may still be considered Italy�s Ace of Aces. The recent analysis of the logbooks of Vito Rinaldi an Italian WWII fighter pilot indicate possibly he had been an ace. According to his logbook, he claimed 9 kills and 9 shared victories. During his time in the Aegean, the Germans also decorated him. Vito Rinaldi does not feature in any lists of known Italian aces, however all the pages of his logbook are signed by his various commanding officers thus giving some crediblity to his claims. Arena, N., �Air war in North Italy,� STEM MUCCHI Pub., 1975. Massimello, G., �Adriano Visconti asso di Guerra,� Albertelli Edizione, 1997. AeroFan Magazine, Biron, G., Personal Note Book, N.66, p. 174, 1998. 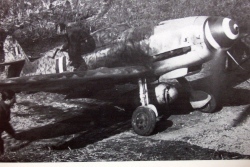 Adriano Visconti's ANR Bf.109G August, 1944.